Watson Ferris (1804-1853) was the great-great-great-grandson of Jeffrey Ferris through his son, John, and one of the more adventurous of his descendants. The honorific “Captain” was earned as a sea captain. Much of the good captain’s life is a mystery. RootsWeb at ancestry.com, comes the information that he captained many ships carrying Irish immigrants from Europe to New York City. List or Manifest of passengers, Ship St. George, Dec. 2, 1846. List or Manifest of passengers, Ship Westchester, April 4, 1842. Westchester struck an iceberg on March 24, 1839 while under the command of Captain Ferris. It struggled in the port in Liverpool on April 19. The incident is described in the May 18, 1839 edition of the New Orleans Commercial Bulletin. Watson Ferris died in the American enclave called Aspinwall which later became, Colon in Panama. His death in 1853 was due to the tropical illness called chagas or chagas fever. Other sources describe the fatal illness as malaria. Find a Grave states that he died of yellow fever. The United States Navy honored Watson Ferris during World War II by naming a “St. Lawrence River canal size ocean cargo vessel” after him. It was used in the grain trade after its commissioning and then transferred to the British via Lend Lease. The ship, hull number 15, was delivered in July 1943 and was wrecked and scrapped in 1950. Notes on the fate of the Watson Ferris. 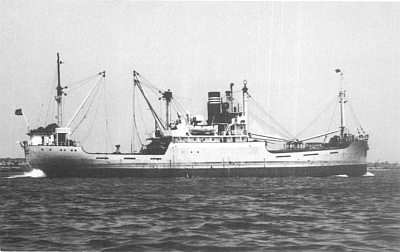 Ran aground in fog on the Bristol Channel in 1949, refloated but ran aground in South Wales again, refloated, no economic basis. Scrapping in Briton Ferry, South Wales. The community of Aspinwall was founded by William Aspinwall as one terminus of the Panama Railroad that he was building in semi-secrecy. The railroad would connect both coasts across the Isthmus of Panama and eliminate the dangerous and lengthy sail around Cape Horn. The New York Historical Society has in its collection a telescope that may have belonged to Captain Ferris. The Watson Ferris house was located in what is now the Bronx, in or about Throggs Neck and today’s Ferry Point Park. It was located on Mayflower Avenue until 1964 when it was demolished.